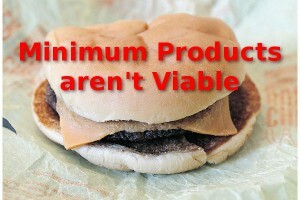 Are you sacrificing your success to the cult of Minimum Viable Product? MVP is a popular mantra in the startup world. Like other religious dogma it’s based on half truths & myths, wastes your time & money, and prevents you from finding the truth. How does MVP kill startups? Satisfying customers is the #1 most important goal of a business. If you don’t focus on satisfying customers with laser beam accuracy and Olympic power lifter intensity then give up your dreams of profits. As a startup, your goal is to get enough real paying customers so that your business pays you instead of sucking your life out leaving you to beg in the unemployment line. Do you actually want a lean startup? Isn’t fat pockets overflowing with cash what you really want? You can have what you really want. Minimum Viable Product sets the wrong relationship with your potential customers. You want happy customers. You want customers jumping up and down telling their friends how great your product is. You want customers blown away by the tremendous value they get from you. Minimum Viable Product says give the least customers will accept. Do the least you can get away with then clock out for the day. Apple certainly didn’t get more money than the US government by shovelling junk. If you want premium prices and hoards of fans you better give customers something insanely great. The bare minimum is what third world dictators drop for their poverty ridden suffering slaves. Paying customers have a choice and it isn’t the minimum. Customers want the best and will gladly pay to get it. Another example of the backwards cult thinking of Minimum Viable Product is the word “product”. Customers don’t care about your product. Customers want the results. If they could get the results without any product that is exactly what they would do. Customers eagerly pay for valuable results. The more value you can deliver the more money customers will pay and the happier they will be doing it. I hate silly buzz words and acronyms because it over-simplifies a serious topic that requires some care and thought. If you need a buzz word I suggest this, Most Possible Value (MPV). That puts the focus on the correct things, delivering value. Deliver the most value you can. What can you profitably deliver with the resources available? That is where most people stumble. They falsely believe they must build super expensive solutions. That leaves most entrepreneurs fearful and willing to cut corners and try to sneak the minimum past. Stop! Delivering value is much easier than building a product. Remember, customers want value, they want the results. They don’t care how you deliver that value. A super expensive technology product is just one of a very long list of ways to make the results customers value and will pay you to get. When you break out of the old thinking and focus on delivering value then you can see there are dozens of ways of achieving the real goal of profitably satisfying customers unmet desires. If this got you thinking then please share it. If you want to join me delivering the Most Possible Value (MVP) then signup so I can tell you how I’m going to help everyone Make Value Happen.